Human Rights Group: China Using Embassies to Repress Muslim Uighurs in U.S.
Human Rights Group Warns: China Using Embassies to Repress Muslim Uighurs in U.S.
Beijing is using its embassies and consulates to export repression targeting members of China’s predominantly Muslim Uighur minority group abroad, including the United States, a human rights activist told American lawmakers on Wednesday. The human rights activist detailed how the Chinese government is targeting U.S. citizens of Uighur descent, namely journalists and activist, forcing their family members in China into so-called “re-education camps” to intimidate them. The Chinese government has long sought to control the narrative of Chinese politics within Chinese communities overseas though tools including the education departments of their embassies and consulates, using them to disrupt events held by activists on college campuses and elsewhere…The targets of this harassment include Uyghur and Tibetan rights activists…The goal of the Chinese government’s harassment is to discourage and disrupt political activism among Uyghurs living abroad, replicating the system of control that exists in their homeland. Threatening retaliation against family members who remain within the borders of China is one of the Chinese government’s primary tools. The families of U.S. citizens and Radio Free Asia (RFA) journalists, Gulchehra Hoja, Shohret Hoshur, Mamatjan Juma, Jilil Kashgary, Kurban Niyaz, and Eset Sulaiman, who have been at the forefront of exposing the extent and conditions of the internment camps, have been targeted by the Chinese government in a bid to silence independent reporting. The journalists went public to describe how Chinese authorities have arbitrarily detained family members in internment camps. Beijing has also attempted to intimidate RFA journalist Shohret Hoshur by sending some of his relatives to the internment camps, also known as “re-education” centers. “This kind of harassment and punishment had touched the lives of many Uyghur-American families,” including human rights activist Rebiya Kadeer, Turkel noted. Turkel urged the United States to take action against China’s mistreatment of Uighurs, suggesting that the Asian giant is committing “genocide” against the minority group. “Credible reports of deaths in custody, torture, and systemic political indoctrination must propel the United States into action on behalf of the Uyghurs,” he said. The Trump administration and some American lawmakers are considering imposing sanctions on Chinese officials involved in the oppression of Uighurs. The Chinese government has portrayed Uyghur ethnic distinctiveness as a threat to ordinary Chinese and the Uyghurs’ Islamic faith as a contagious disease. Sinification through Chinese language and culture sessions and compulsory denunciations of Uyghur culture and belief in Islam in the internment camps are justified as necessary measures in reducing this threat and in finding Beijing’s final solution. State-led racial discrimination and criminalization of Islam and any expression of Uyghur identity and culture have affected all Uyghurs in the Uyghur homeland and China, as well as Uyghur Americans and hundreds of thousands of Uyghurs who live outside their home region. 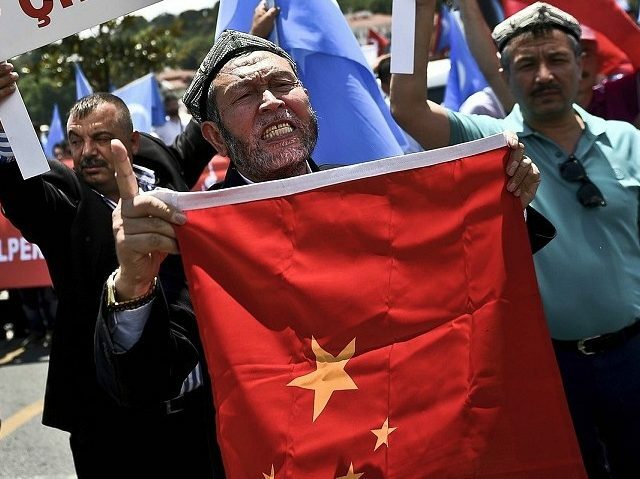 China has sent “over a million and possibly more” Uighurs accused of terrorist and separatist activities and their children, into internment camps across Uighur-majority Xinjiang, the largest province in the country. “If both parents are in jail, the child will be sent to a re-education centre for ‘special children.’ The child is forbidden to go to school with the normal [author’s italics] children because the parents have a political problem,” a former instructor at one of the internment camps told the Financial Times in July. According to the Financial Times, Chinese authorities are employing forcible separations of Uighur children from their extended families. China cites terrorist attacks in Xinjiang attributed to Uighur jihadis to justify its heavy-handed security measures and “re-education centers.” The Asian country has long denied oppressing its Uighur minority.